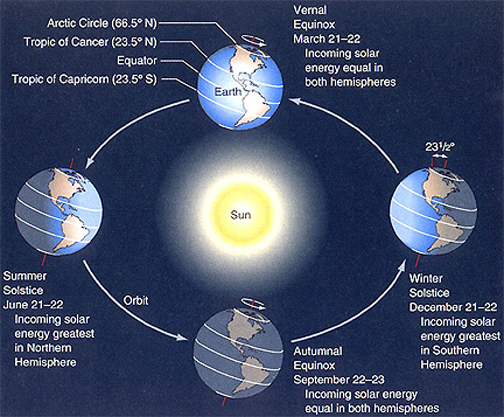 Today is the December Solstice, the first day of winter in the northern hemisphere. The new season officially began at 17:11 UTC, which is 12:11pm Eastern Standard Time. The astronomical seasons are produced by the tilt of the Earth’s axis – a 23.5° angle – and the movement of the planet around the sun. During the winter months, the northern half of the Earth is tilted away from the sun. This position brings the hemisphere its least amount of solar energy and its coolest temperatures of the year. Since the summer solstice in June, the arc of the sun’s daily passage across the sky has been dropping toward the southern horizon and daylight hours have been decreasing. 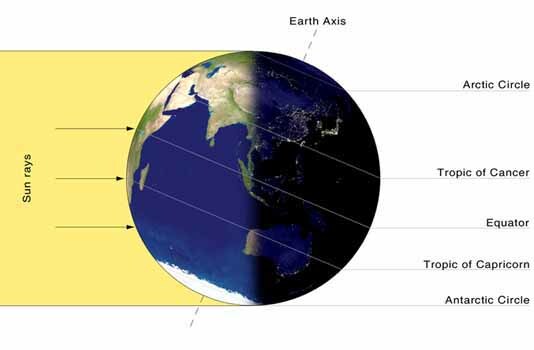 Today, it reached its southern most position at the Tropic of Capricorn and marks the shortest day of the year. This observable stop is where today’s event takes its name. Solstice is derived from the Latin words “sol” for sun and “sisto” for stop. Now, the sun will move northward again in our sky and daylight hours will slowly start to increase. Marking this transition, the winter solstice has long been a cause for celebration across many cultures throughout human history. This entry was posted in weather and tagged seasons, space, winter by Melissa Fleming. Bookmark the permalink.